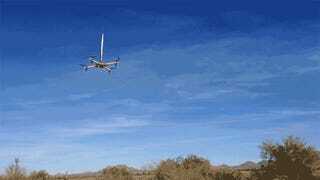 Forget concerns over surveillance and privacy when it comes to quadcopters and drones filling the skies. A member of Flite Test—a site dedicated to custom flying creations—built a quadcopter with a built-in launch pad for firing model rockets while in flight. The quadcopter itself appears to have been built from scratch from balsa and other lightweight materials so that it could carry the extra weight—as minimal as it may be—from a model rocket.